Each year, student artists from Edmonton Public Schools and Edmonton Catholic Schools have their art unveiled at the Shaw Conference Centre’s pARTnership Gallery. 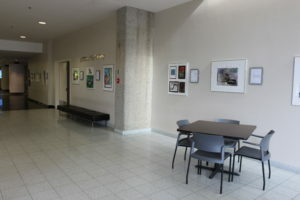 The Shaw Conference Centre opened the pARTnership Gallery in 2010 as its further commitment to public art, student growth, and community engagement. Now in its sixth year, this annual exhibit is a collaborative partnership between the two Edmonton school districts, the Shaw Conference Centre, and The Works Art & Design Festival. The Shaw Conference Centre’s high-traffic corridor gives the exhibit exposure to half a million visitors each year. It is also a venue to The Works Art and Design Festival, which runs for 13 days every summer at various locations throughout the city.